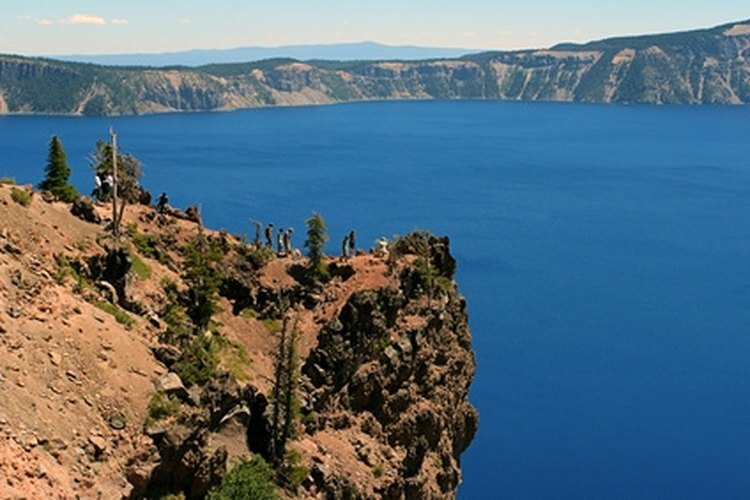 Crater Lake is a popular southern Oregon attraction. Campers looking to enjoy longer stays at southern Oregon RV parks can take the time to enjoy the many recreational attractions the area has to offer, from the Pacific Ocean and Crater Lake to the Siskiyou Wilderness and the Rogue River, all within a few driving hours of each other. Several extended-stay RV parks are located across the southern part of the state from which to choose if you're planning to visit the area. The Moon Mountain RV Resort is located in Grants Pass, Oregon, on the south side of town and offers monthly rates throughout the year. Sites are equipped with full or partial hookups and supplied with 20-, 30- and 50-amp electrical power with several pull-through sites available to accommodate larger vehicles. Park amenities include laundry and shower facilities, on-site propane and free wireless Internet. A day-use park and access to the Rogue River are within walking distance of the campground. Grants Pass is centrally located to Interstate 5 and Highway 199, with Crater Lake, the Oregon Coast and Ashland within a 2-hour drive. Moon Mountain provides discounts for Good Sam, Woodalls and AAA members. Located along Highway 199 in southern Oregon, the Lone Mountain RV Resort is within an hour drive of Crescent City at the California border and in proximity to Oregon Caves National Monument and the Cascade-Siskiyou Wilderness. The campground provides monthly and year-round rentals on sites with 20-, 30- and 50-amp electrical service and can accommodate large rigs with multiple slide-outs. Amenities at the park include free wireless Internet, shower and laundry facilities, barbecue grills, a gazebo and a picnic area and nearby access to a riverfront beach and swimming area. A grocery store and gas station are less than 1 mile from the park and an on-site store sells common RV supplies. This southern Oregon coast RV park is located 1 mile from the Pacific Ocean and enjoys riverfront camping along the Chetco River, popular for rafting, swimming and fishing. Monthly rates include sewer, water and cable TV service with 20-, 30- or 50-amp electrical power metered by the month. Campers choose from six sites within the park from basic to riverfront properties. Pull-through access is available. The campground features a fitness center, a game room, shower and laundry facilities, private river access and a boat launch. Free wireless Internet is available with enhanced service provided to those staying long-term.